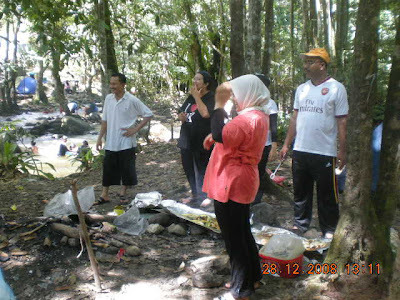 On Sunday 28th December, five chess families went to Hulu Yam for a family day. One of the objectives is to give the kids a break from chess tournaments. Moreover, it is a school holiday. It is also to give the kids the opportunity to have fun together since they have to battle each other during chess tournaments. Below pictures show how happy and joyful were the kids as well as their parents. Super MOMs at work. These very dedicated, hardworking and supportive mothers to their chess players children must be appreaciated and thankful. Hopefully, their children will achieve more honors and success in chess as well as their academic. 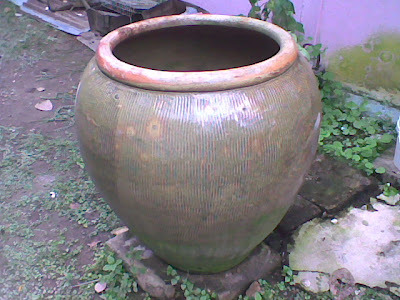 "Terima kasih", moms! The big boys also capable to setup a tent besides setup chess pieces. 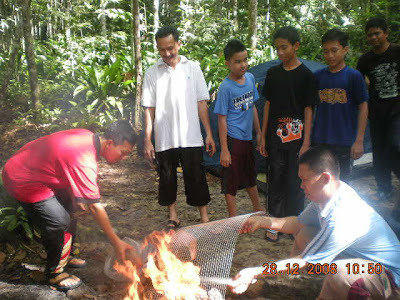 The DADs were showing new skill to their boys. 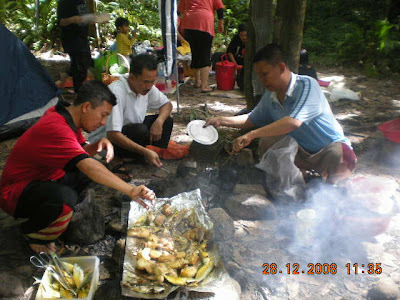 Who say that DADs can not cook. GiLoCatur is enjoying his food in the nature. Wow! Lots of delicious dishes to eat. Come in queue boys and girls. The "poison box" is planned for y'all. Chess parents were watching their children's antics. Future Malaysian Woman Grandmaster (WGM) was doing a robot walk while others cheering. 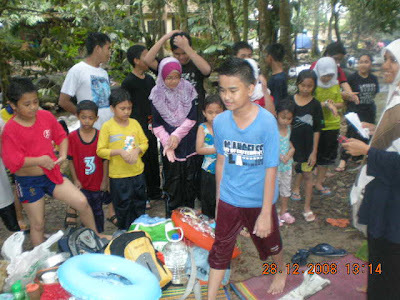 Future Malaysian GM showed his antic while still being wet coming out of the river. The children were laughing with joy forgetting their chess activities for a while. The family day was fun and thrilling. Hopefully, similar event can be organized and held in the future where more chess families can join and participate. Maybe this time can stay overnight. Till next time. Kudos to everyone who make the event possible. Reading Kosmo newspaper today I was attracted to Ragam Global! on page 50. I want to share it here. 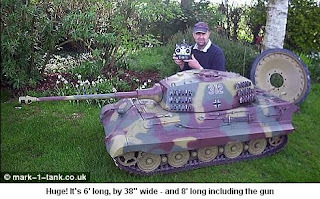 1) Mini tank known as mini King Tiger. Watch out guys who love to play remote-control helicopter, car or aeroplane. I think I have yet seen it in Malaysia. A company in Britain has created a remote-control mini "kereta kebal" as per the above picture. But mind you the cost is 10,000 pound sterling. :)- More details about it, please check this link. 2) If you found a quite huge sum of money, would you return it? A lady named Debra Rogoff in USA is so honest that she returns a US10,000 money she found while buying a box of crackers from a grocery store. The money actually belongs to an elderly lady who does not believe to keep her money in a bank. Sound familiar eh? In Malaysia, GiLoCatur believes still many people especially the old generation who keep their money at home - under pillow, in the closet etc. Many lessons from this story. BE HONEST! HONEST PEOPLE ARE EVERYWHERE IN THE WORLD. EVEN IN THE DEVELOPED COUNTRIES, SOME PEOPLE STILL HAVE DOUBTS OF THE MODERN STYLE OF LIVING LIKE THE SECURITY OF THE BANK. 3) In London, the firemen from Bukinghamshire used baby oxygen mask to help six cats from dying of breathing smoke in a house fire. What a treat for those cats in Britain. Here in Malaysia, many cats are treated badly and being abused. Hopefully, such bad attitude towards animals like cats will change. 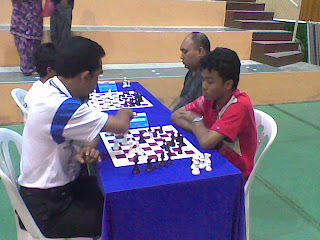 GiLoCatur played white against Kamal Azmi Wahiduddin, the older brother of NM Kamal Arifin in Round 3. GiLoCatur is yet the same class / level with him since he has 1617 national rating . GiLoCatur was punished for not giving attention to his white Bishop threat. 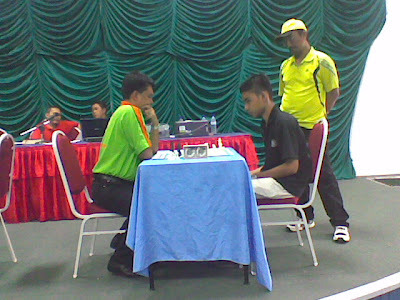 Another GiLoCatur's chess buddie, Mohd Faizul, in action playing white againts NM Zarul Shazwan. 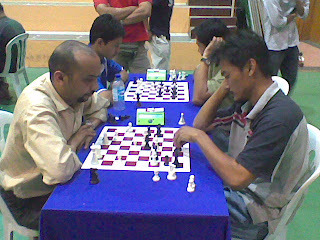 Roslan Sulaiman from Sungai Besar played white againts NM Zarul Shazwan Zullkafli (1903). 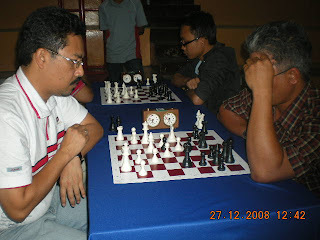 GiLoCatur was being told by Roslan that the meeting point for Sungai Besar and Sabak Bernam area chess players is at a hawker center near Dataran Sungai Besar. Surely, GiLoCatur will go there whenever going back hometown during public holidays and have chess games with my hometown folks. By checking the latest national ratings (based on October 2008), Roslan is quite a strong player. He is a 1600+ rating player. Muhd Bukhari Sulkifly aka Boey (Nat. ratings 1546) was playing againts NM Kamal Arifin Wahiduddin (1832). GiLoCatur had a very tight game with him in earlier round. He was mistakenly enrolled in the Open category. But GiLoCatur believes by participating in this category he can have very good experience by playing againts top local chess players as he plan to make an impact in the next year MSSM. NM Kamal Abdullah (1952) aka Empire Strikes Back vs Norazman Ismail (1682). 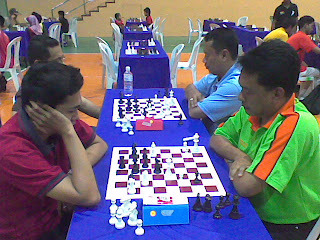 Mohd Hanizam of Tanjong Karang (blue shirt) is also one of GiLoCatur's chess friends. 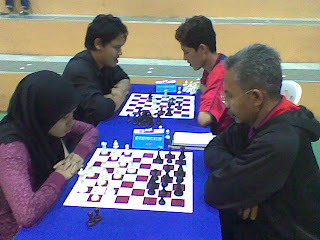 WCM Nur Shazwani Zullkafli (1808) vs veteran player, Cikgu Mat Zaki Yeop (1568). At the back, Faizal Andin (1749) vs Abdullah Che Hassan (1821), the champion. World Police Champion Ismail Ahmad (1910) was concentrating on his game. 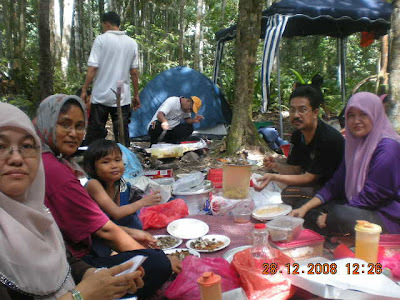 Beside him is Mohd Fauzi Bin Ahim (blue shirt) whose hometown is also Sabak Bernam like GiLoCatur. In fact, several GiLoCatur elementary school mates were also his secondary school mates. 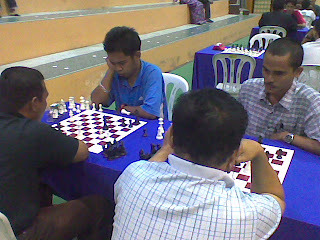 One of GiLoCatur's chess buddies, Razali Hamzah aka Ng6 (1566) wearing black shirt was very focus on the chessboard. GiLoCatur had a couple of games with him in between rounds. Open category Top 3 winners - Abdullah Che Hassan (RM500), Ian Udani (RM400) and FM Mok Tze-Meng (RM300). Under 12 category Top 3 winners - Roshan Ajeet Singh (RM250), Irfan Haqqim Azhar MS (RM200) and Fikri Bin Saleh (RM150). 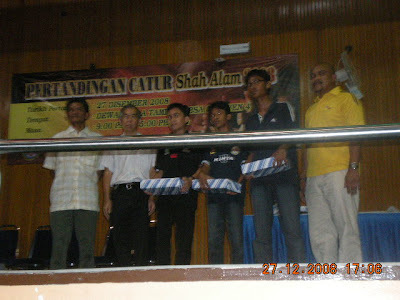 They were among the 2008 Top 6 Under 12 MSS Negeri Selangor winners. 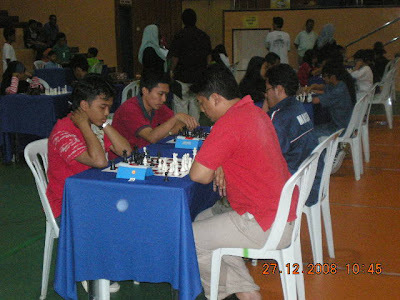 About 160 players participated in the MBSA Chess Open held at a hall in Section 4, Shah Alam on last 27th December 2008. It is very good news for Shah Alam residents especially since Shah Alam used to have many chess tounaments organized in the past. Shah Alam is also used to be called "Bandar Catur" or The Chess City. Hopefully, MBSA will organize many more such tournaments every year. The winners were presented their prizes by the Shah Alam Deputy mayor, Encik Mokhtar Hani, and MBSA Zone 5 council committee, Mr Soo Kim Ling. Understand and follow the principles of chess as per advised by GM Susan Polgar if you as a chess player want to be successful. The center of the board includes the squares e4, d4, e5, and d5. When you start a game, place your pawns in the center to occupy and control as many of these squares as you can. Location, location, location! 2. Develop Your Pieces as Soon as Possible! Get your Knights and Bishops out right away. 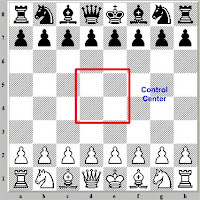 This should be done before you try to checkmate your opponent, some time in the first 6 or 7 moves if possible. 3. Castle as Soon as Possible! Castle at the very first chance you have in order to keep your king safe. Remember, you can’t win if your king isn’t safe and you get checkmated first. So don’t forget to castle! Then after you castle, connect your rooks by developing your queen. 4. Keep Your Pieces Protected! Don't leave your pieces hanging without protection. Each and every piece you have is very valuable, so don't forget to protect them. Protecting means if your opponent can take your piece, then you can take your opponent's piece. 5. Have Fun and Win with Grace, Lose with Dignity! This is my motto in chess. First and foremost, chess should be fun. Sometimes you win and sometimes you lose, it’s all part of the game. When you win, be a good sport and don’t trash talk or make fun of your opponent. When you lose, be an even better sport and not a sore loser. Shake hands and congratulate your opponent. This will go a long way toward making good friends. As I surf the net looking and reading chess-related news and info, I found the following article. It is about a 15 year-old UAE boy named Salem A.R. Saleh, (mind you my name is in it he he he), who is the youngest Arabian GM. He was rewarded a DH 100,000 for that feat. Wow!! I hope that our young Malaysian chess talents like Yeoh Li Tian, Nur Nabila, Nur Najiha, Irfan Haqqim, Puteri Rifqah, Puteri Munajjah, Ee Sun-Xin, Nur Faqihah, Amier Hamzah and Mohd Faqih can follow such feat. MALAYSIA BOLEH! SHARJAH - Salem A.R. Saleh rewrote history by becoming the youngest grand master in Arabia. MASYAALLAH! SUNGGUH INDAH CIPTAAN ALLAH YANG MAHA BERKUASA. I found below article regarding the recent KLCA Chess Open at Utusan archive. KUALA LUMPUR 21 Dis. 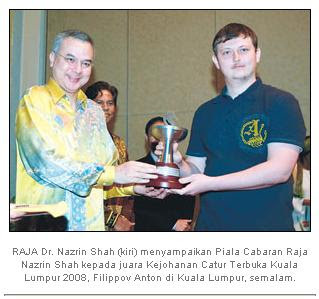 - Raja Muda Perak, Raja Dr. Nazrin Shah hari ini berangkat menyempurnakan majlis penutup Kejohanan Catur Terbuka Kuala Lumpur 2008. Baginda turut menyampaikan Piala Cabaran Raja Nazrin Shah kepada peserta dari Uzbekistan yang menjuarai kategori terbuka iaitu Filippov Anton. Anton membawa pulang Trofi Cabaran Raja Nazrin Shah dan wang tunai RM10,000. Kejohanan berkenaan yang berlangsung dari 15 Disember hingga hari ini menawarkan hadiah wang tunai berjumlah RM45,000. Raja Nazrin bertitah, catur merupakan permainan yang menguji kemahiran taktik dan strategi selain mampu mencerdaskan pembangunan mental seseorang individu. "Kehadiran ramai pemain Grandmasters di Malaysia bagi kejohanan ini merupakan satu perkara yang menggembirakan dan diharapkan lebih ramai rakyat Malaysia berminat untuk mempelajari permainan hebat ini," titah baginda. Baginda bertitah demikian dalam kenyataan media yang dikeluarkan sempena berakhirnya kejohanan tersebut hari ini. Hadir sama Canselor Kolej Universiti Sains Kesihatan Masterskill, Raja Datuk Seri Azureen Sultan Azlan; Presiden Persekutuan Catur Malaysia, Tan Sri Ramli Ngah Talib dan Presiden Persekutuan Catur Persatuan Negara-Negara Asia Tenggara (ASEAN), Ignatius Leong. 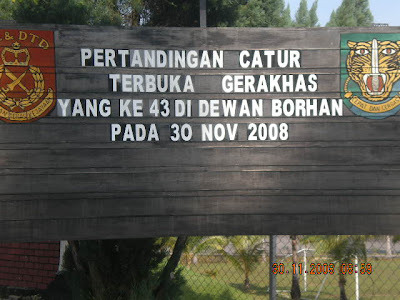 Kejohanan Catur Terbuka Kuala Lumpur 2008 disertai oleh 140 pemain dari 11 negara termasuk Uzbekistan, Indonesia, Filipina, Vietnam, India, China dan Myanmar. Sementara itu, Presiden Persatuan Catur Kuala Lumpur, Datuk Edmund Santhara berkata, persatuan berkenaan komited untuk meningkatkan minat terhadap permainan catur di kalangan belia di negara ini. "Kejohanan catur yang akan berlangsung pada tahun depan bakal menyaksikan penganjuran yang lebih besar. "Pembangunan kemahiran catur akan diadakan di kalangan golongan muda melalui kelas dan seminar," katanya. 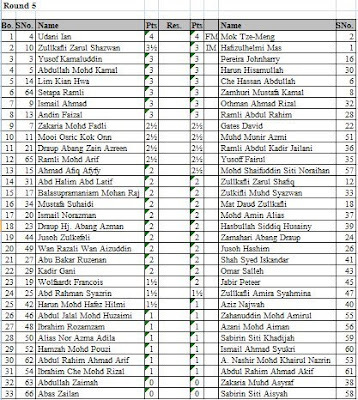 I got text message from En Azhar MS regarding the results of the 4th CRC Taiping Chess Open held yesterday. 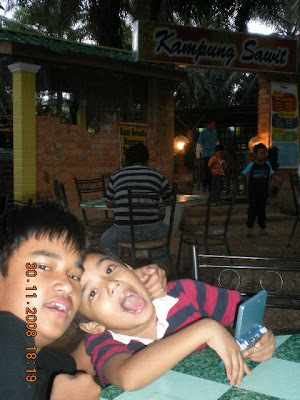 As for his other children, Syakir won the 10th place in Open. Irfan was 11th place in Under 18 and Puteri Munajjah also 11th in Under 12 category. The KLCA Chess Open had just ended yesterday. 9 rounds had been played from Monday, 15th December 2008 until Saturday, 21st December 2008. Around 140 players not only from Malaysia but also from several other countries like Singapore, Indonesia, Philippines, Vietnam, India, Pakistan and Uzbekistan participated in the tournament. There are two categories - Open for players with FIDE ratings 2000 or above and Challengers for the opposite. The champion for the Open section is GM Filippov Anton from Uzbekistan. He who seeded 1st accumulated 7 points out of 9 rounds. Wheareas the talented local girl, Nur Nabila Azman, won the Challengers category with 7 1/2 points. 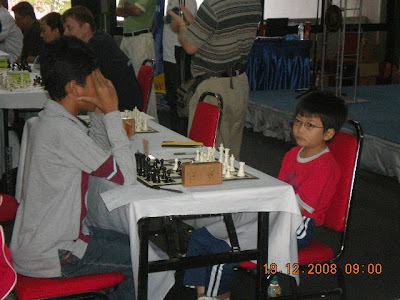 Other Malaysian chess prodigy, Yeoh Li Tian, won the 2nd runner up. These two Malaysian youngsters have very bright future. 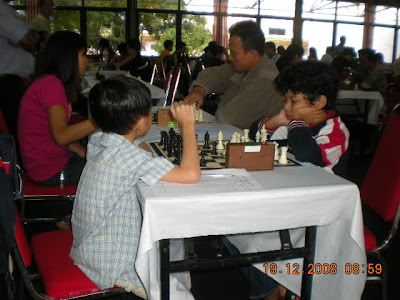 BRAVO to their dedicated parents for supporting and coaching them to be future Malaysian chess stars. 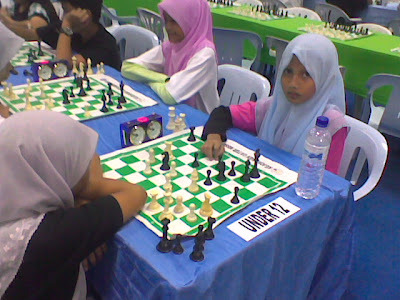 Hopefully, their efforts will continue and in future put Malaysia in the world chess map. While I was searching for castlingqueenside info and past games through google I came to a chess-related blog that really impress me. The blog uses the word as its name. The blogger is a 54-year-old american where its contents are news, info and photos of chess events in USA. The blog is worth reading where it provides me the insight of chess events in USA especially through the pictures. 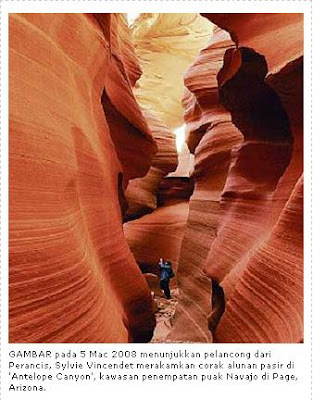 So especially to the Malaysians please go the blog to see how alive and and spectacular chess in 'Uncle SAM' country. 2nd seeded FM Mok Tze-Meng play black againts 4th seeded Pinoy Ian Udani on Board 1 with perfect 4 points each. While the 1st seeded IM Mas face Zarul Shazwan on Board 2. 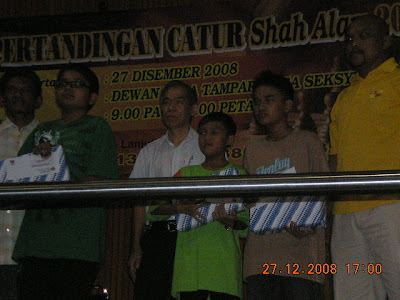 Besides the KLCA Chess Open that will end today and the prize giving ceremony tomorrow, the Pencarian Jaguh Negeri Terengganu is still on going until 22nd December 2008. It started on 18th December 2008. 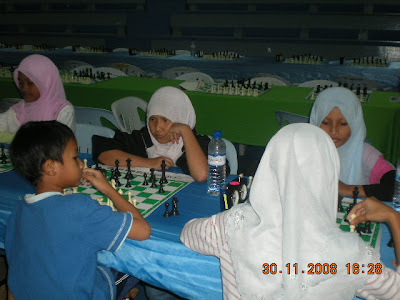 GiLocatur is very happy because there is going to be a chess tournament in Shah Alam by MBSA in the near future. The details of the tournament is as per below. 5 Round, Time control is 20 minute, Swiss System. Limited to the first 200 participants. The closing date is 24 December 2008. To register please call 03 5510 5133 ext 385/391/435 or Fax to 03 5513 8513. Bahagian Sukan, Jabatan Korperat, Tingkat G, Wisma MBSA, 40000 Shah Alam. 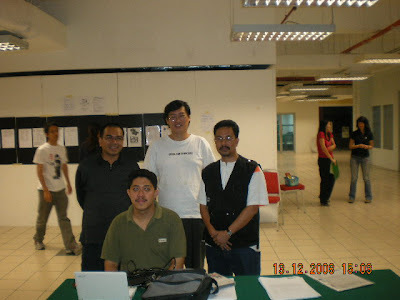 Four Malaysian bloggers have united in providing news, info and photos of the on-going KLCA Open held in Commonwealth Hall, Bukit Jalil from 15th to 21st December 2008. They are Marcus Yeoh, Andrew Ooi, Hairul and myself. The unofficial blog can be accessed at http://klopen.blogspot.com/. The effort has been noticed and given positive feedback from a Philliphine blogger in his blog. Such nice feedback surely will encourage and motivate us to continue the effort to promote chess in Malaysia particularly and in the ASEAN region as well. Malaysian Aspiring and Promising Future! 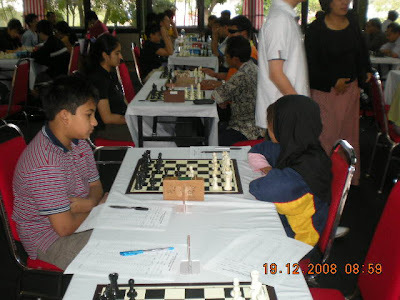 The above pictures show some of the aspiring and promising Malaysian youngsters who can excel in chess. 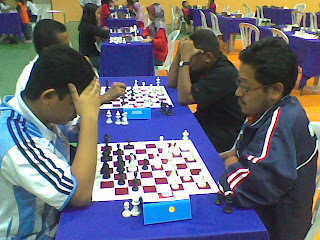 They are currently participating in the KLCA Chess Open in Challengers category held in Commonwealth Hall, Bukit Jalil. The category is for all chess players with FIDE ratings below 2000. All of them are 10 years old or below. They love chess and are enthusiastic to win honors in chess tournaments. They are supported by their dedicated parents who provide the necessity and requirements to excel in chess like coaching, chess materials, motivation and tournaments fees. Besides the parents, these intelligent youngsters also require support from other parties to improve further and achieve honors like getting title and winning chess tournaments both local and international. 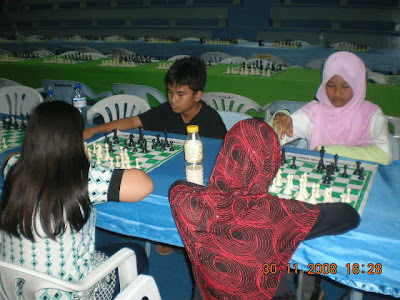 The government via relevant agencies or ministries to provide basic facilities, funds and chess-related programs. The local chess authority to plan, manage and facilitate local chess activities and programs. The media both electronic and newspapers to provide coverage to all chess-related activities like tournaments and workshops or having chess columns or segments. The society to be involved and participate in chess-related events and to have active chess clubs. The schools and teachers to support and activate chess clubs, organize in-house chess tournaments and training. Malaysia surely can produce chess geniuses and have chess Grandmasters, the highest chess title, when all parties play their important roles. If Malaysia can allocate a sum of money in space program, surely it can allocate also for chess program to produce chess GM and win world class tournaments. MALAYSIA BOLEH! 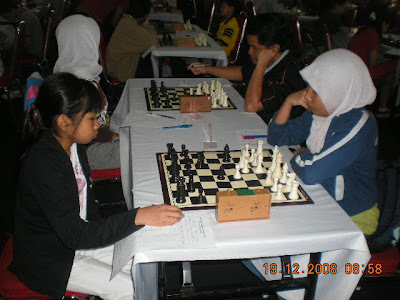 One of my chess buddies, Cikgu Jamaluddin, playing black in the first round againts one of Indonesia's promising young talent, Medina Wardina Aulia. He lost to the 11 years old girl. Jamaluddin just played in the recent GACC tournament. Kids, do you know what is this?? Just want to check the knowledge of nowadays children especially the city kids, do you know what is the above picture called? What is it for? The older generation shall know what it is especially the village folks. Standing from left : Stonemaster, G!LaChess, and GiLoCatur. Hairulov sitting in front. It is a unique photo session of few Malaysian bloggers at the National Juniors Chess Championship today. GiLoCatur and G!laChess are basically at the tournament scene most of the time. Today, two other active local chess bloggers i.e. Hairulov and Stonemaster came to the tournament venue. 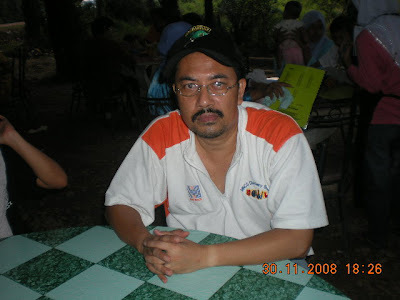 It is quite unfortunate when today Marcus Yeoh, one of the arbiters, is not around due to class comittment. For me, it is really an honor to be in a photo with active and dedicated chess bloggers. They are like my mentors. Furthermore, they are also strong chess players. 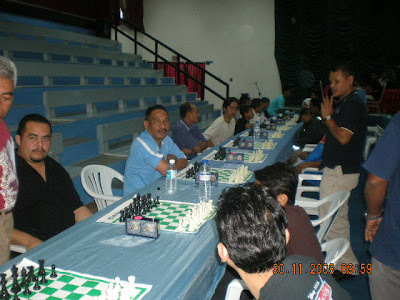 Their tireless efforts hopefully help promoting and enhancing chess in Malaysia. Keep up your blogs, fellas! Pagi tadi GiLoCatur mendapat berita tentang kepulangan ayah Mas Hafizul yang sedang berjuang mendapat title GM untuk negara ke rahmatullah dari Marcus di Pearl Point. Sekalung takziah diucapkan kepada Mas dan keluarga beliau. 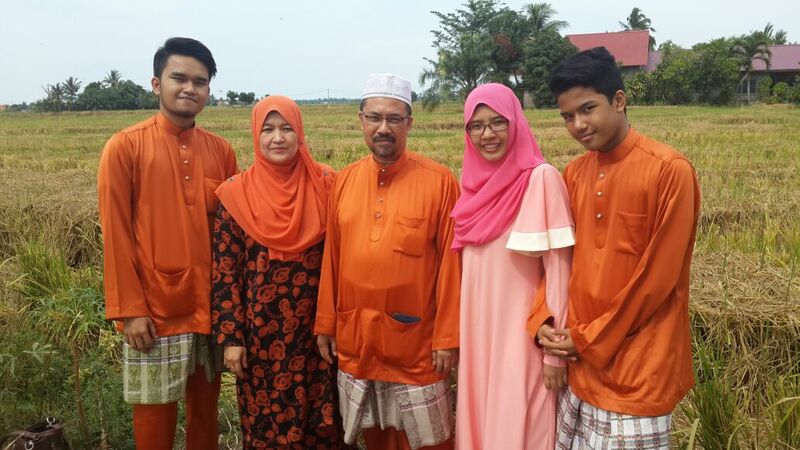 Hati anak mana yang tidak sedih jika kehilangan seorang ayah. Apatah pula yang sangat dedikasi dan tinggi pengorbanan dalam membentuk anak menjadi seorang pencatur hebat di negara ini dan insya Allah juga di peringkat antarabangsa. 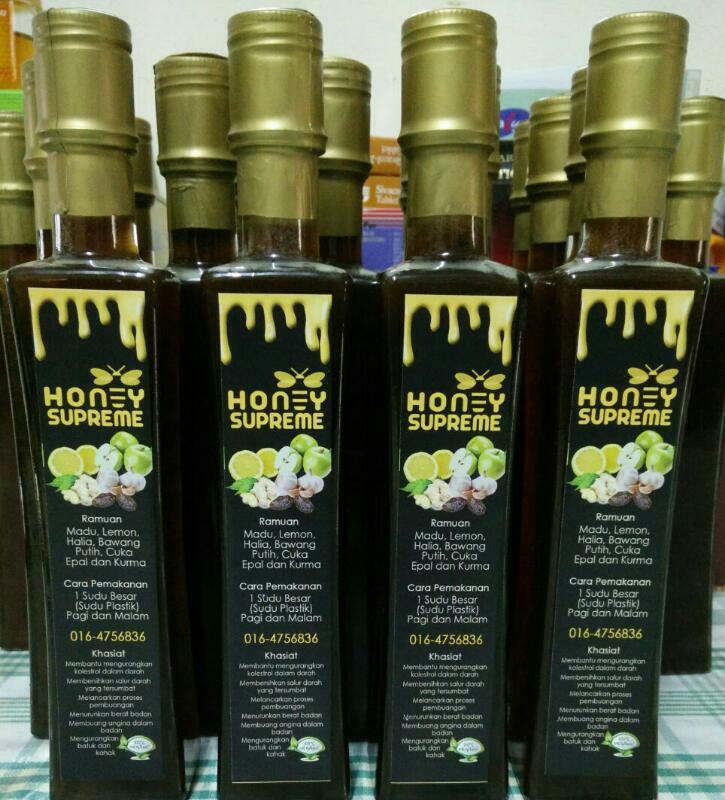 Semoga Mas tabah dan lebih bersemangat untuk mendapat gelaran Grandmaster pertama negara sebagai hadiah buat ayah beliau tersayang. Marilah sama-sama kita berdoa semoga allahyarham ditempatkan di kalangan orang-orang yang soleh dan mendapat rahmat dariNYA. ALFATIHAH!! 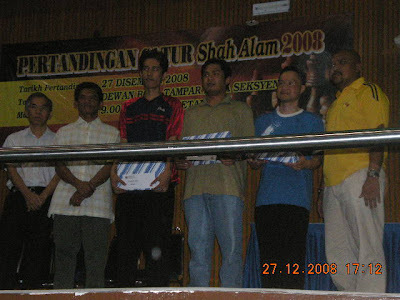 THE FINAL STANDING FOR OUG ( CKK ) CHESS COMBO 2008. 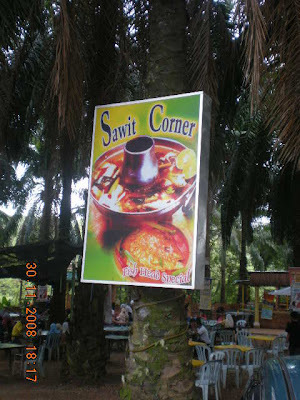 After the prize giving at the Gerak Khas Chess Tournament, I treated my family especially both Fikri and Anis for winning the Under 12 category at SAWIT CORNER. I noticed about the place while my family and I were on the way to the hotel on Saturday. There were so many cars park along the road near the place. Surely, I want to try eating at the unique eatery. My children ordered Nasi Goreng Pattaya while me and my wife ordered nasi putih with Gulai Kawah Ikan Tenggiri and Asam Pedas Ikan Kembung. The taste is OK. Maybe next time I will try Pecal that looks delicious. Me feeling tired after the chess tournament. Oh yeah, what was my score? I won three games. 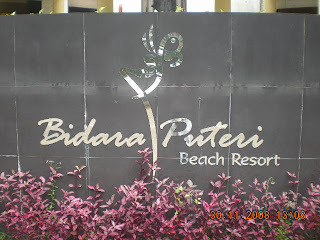 I abandoned one game because I need to pick up my wife and youngest son and check out from Bidara Puteri Resort which is located about 10 km (20 km in total, going and back) from the tournament venue. I made silly blunders during the first two rounds. The organizer has put the acknowledgement of the chess tournament at a big billboard. A very nice effort. 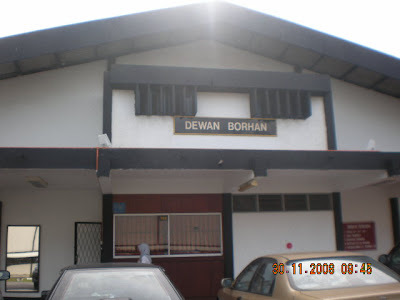 The "Dewan Borhan" where the tournament is held. A very conducive and nice place for a chess tournament. I think it is much better than the venue for WYCC2008 in Vietnam. 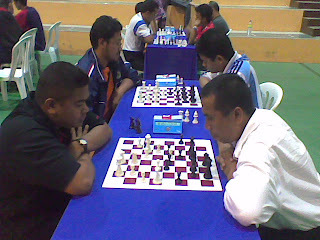 The champion, NM Kamal Abdullah, and the first runner up, Kamaludin Yusof, facing each other in the top board. Only both of them who do not lose any game in the tournament. With 6 wins and 1 draw, both scored 6 and 1/2 points. Only the tie breaks have separated them. Ismail Ahmad and FM Anas fought for the third place where finally the latter won. Fikri won the Under 12 category with 6 and 1/2 points. Anis Fariha is the first runner up with 6 and 1/2 points. The Open category participants are eager waiting to start one of their rounds. The prizes to all winners was presented by Kapten Hanafi. TQ and BRAVO to the organizer especially Ustaz Zainal Abidin Mat Noor, an avid and a strong chess player himself, for holding the chess tournament in a very nice venue. And also in helping the participants in whatever way. 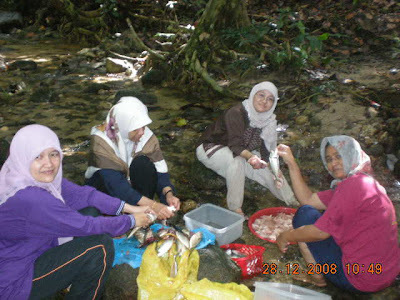 Hopefully, such event will continue next year. Hoping more and more participants shall join. For me, just being in the camp is a very unique experience. I have heard so many times about the camp. And finally I was there. Surely, for security reason the camp is not easily entered just like that.